Value Explore 2 - 20th November, 2016. Mark this date on your calendar "Sunday 20th November" At Mokland Hotel, Toll Gate Bus stop, Sango-Ota. Brace for this! The train is making a halt again at the Sango Ota station. Catch it! 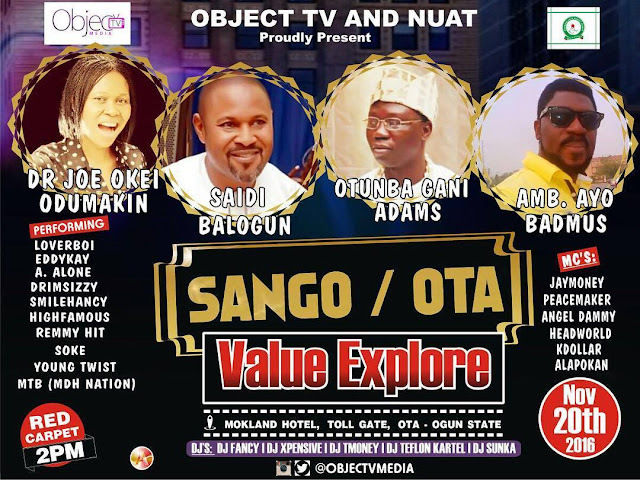 The Value Explore 2.0 on Sunday November 20th, 2016 with Dr. Joe Okei-Odumakin; Otunba Gani Adams; Ambassador Saidi Balogun; Ambassador Ayo Badmus. Music and comedy performances by top notch artistes in Sango & Ota. Venue: Mokland Hotel, Toll Gate bus stop, Agbado-Sango. Date: Sunday Nov 20th, 2016. Time: 5pm -7pm (2 hours event only, no African timing). Live coverage and streaming by ObjecTV Media. It's the 2nd ObjecTV/NUAT Grassroots Peace Concert, supported by 214 Global Link (Mokland Hotel). #ValueExplore #NUAT #ObjecTV#Sango #Ota @drjoeodumakin @saidibalogun @adamsotunba @1storderrapper @roadex. DejiKing Entertainment: Value Explore 2 - 20th November, 2016.